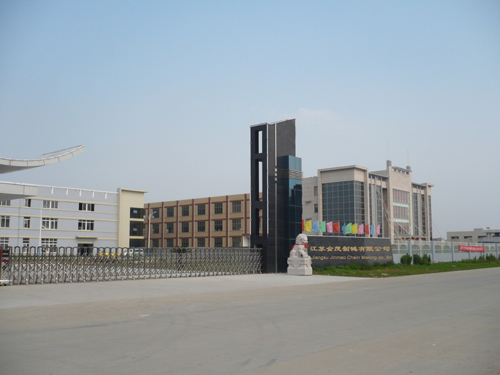 Jiangsu Jinmao Chain Making Co., Ltd is an affiliated company of the general factory, Anchor Chain of Zhenjiang. The company adopts the advanced flash of light and welding technology and equipment. Our company specializes in making all kinds of industrial round ring chains according to International Standard ISO160、national Standard GB/T549-83、B/T549-96、GB/T12718-2001、Ministry of Coal Industry Standard MT36-80. Our company obtained enterprise's self-operation export and import right in October, 2000 and we passed ISO9001:2000 quality system authentication in March, 2002. The main products that our company produces are:14￠ -42￠high-tensile steel chains (round link), ship anchor chain, vehicle colligation chain, tyre chain, quay hoist chain, and various kinds of chains for chain blocks. We also make high-tensile industrial chains of all grades and respective fittings according to foreign standards such as America Standard: USA-STANDARD SPEC; GERMAN Standard：DIN5685、763、764、766; British Standard: BS6405. The company has the creed of sustainable development in mind and the creed of prospering the enterprise with science and technology. We are cooperating all the time with the 708 Research Institute of Chinese Shipping Industry, Research Institute of Coal Industry of Shanghai, Jiangsu Technical College, Zhenjiang Shipping Institute. We also keep in close touch with other institutions and relevant designing units. We are always developing the new round chains after absorbing domestic and international new technology. "Make meticulously, each ring reliable" is our principle. With each member’endless efforts, we are determined to make a most large-scaled company with all kinds of high quality chains in China . Each customer domestic and international is always welcome to contact us. Wish to cooperate closely with various circles of society and to expand a bright tomorrow together.